Astrophysicists of the University of Zürich, ETH Zürich and the NCCR PlanetS show how the icy moons of Uranus were born. Their result suggests that such potentially habitable worlds are much more abundant in the Universe than previously thought. The unprecedentedly complex computer simulations were performed at the Swiss National Supercomputing Centre (CSCS) in Lugano. The solar system has numerous moon-planet systems: Earth, Mars, Jupiter, Saturn, Neptune and Uranus all have natural satellites. But are moons common even around exoplanets orbiting other stars? "This is an intriguing problem in today's astronomy, which is hard to answer at the moment," says Judit Szulágyi, a senior research associate of the University of Zürich and ETH Zürich. The historical discovery of a first exomoon candidate was announced in October 2018 by an American group, but the confirmation of this system is still ongoing. 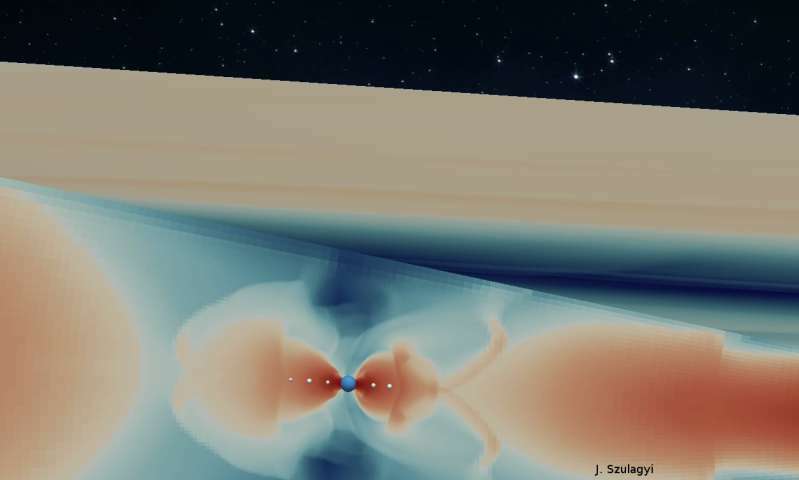 With their work now published in Astrophysical Journal Letters Judit Szulágyi and her colleagues Marco Cilibrasi and Lucio Mayer both of the University of Zürich are one step closer to solving the mystery of how many exomoons there could be and what they are like. The researchers focused on the planets Uranus and Neptune, ice giants with almost 20 times the mass of Earth, but which are much smaller than Jupiter and Saturn. Uranus has a system with five major moons. Neptune, on the other hand, has only one major, very heavy satellite, Triton. "It is intriguing that these two very similar planets have completely different moon systems, indicating a very different formation history," explains Judit Szulágyi. The astrophysicists believe that Triton was captured by Neptune – a relatively rare event. But the moons of Uranus look more like Saturn's and Jupiter's systems that are thought to have originated in a gaseous disk around the planets at the end of their formation. "It was believed that Uranus and Neptune are too light to form such a disk," says the astrophysicist. Therefore, researchers considered that the moons of Uranus could have formed after a cosmic collision, similar to the formation of Earth's moon, also a relatively infrequent event. Now, the researchers have refuted this idea. Their extremely complex computer simulations reveal that, in fact, Uranus and Neptune made their own gas-dust disks while they were still forming. The calculations generated icy moons in-situ that are very similar in composition with the current Uranian satellites. From the simulations performed by the supercomputer Mönch at CSCS, it is clear that Neptune was originally also orbited by a Uranus-like system of multiple moons, which must have been wiped out during the capture of Triton. The new study has wider implications about moons in general. "If ice giants can also form their own satellites, that means that the population of moons in the universe is much more abundant than previously thought," says Dr.Szulágyi. Ice giants and mini-Neptune planets are often discovered by exoplanet surveys, so this planet mass category is very frequent. "We can therefore expect many more exomoon discoveries in the next decade," the astrophysicist says. This finding is also extremely exciting in the view of searching for habitable worlds. In our solar system, the two main targets to search for extraterrestrial life are icy moons of Jupiter and Saturn, Europa and Enceladus. They are both thought to harbor liquid water oceans below their thick ice crusts. "Those under-surface oceans are obvious places where life as we know could potentially develop," says Judit Szulágyi. "So a much larger population of icy moons in the universe means more potentially habitable worlds out there than imagined so far. They will be excellent targets to search for life outside the solar system."